In this paper I discuss the role of the book in a nascent Christian culture and focus in upon its value as a cult object, with particular reference to the cult of St. Cuthbert and the Lindisfarne Gospels. By reappraising some of the underlying physical and theological considerations which shaped the production of the Lindisfarne Gospels, I reconsider its historical context, cultural affiliations, dating and intent. By asking what it might actually have meant to make this remarkable book, and also the Cuthbert Gospel, the early lives of St. Cuthbert and the Ceolfrith Bibles, I consider some of the complex and influential ways in which the Insular world, and Bede's Northumbria in particular, moulded western perceptions of the book and of how it might serve as an instrument and channel of faith. The practice of portraying the Godhead by means of abstract or symbolic substitution was reinforced within the Christian tradition from an early date. The Crux Gemmata and the Gospelbook serve as the embodiment of Christ in the mosaics of Ravenna, they are enshrined with Christ's faithful minister, St. Cuthbert, and they combine in an electrifying symbiosis in the magnificent diptychs of cross-carpet page and decorated incipit in the Lindisfarne Gospels, where, I would suggest, the crosses and adorned words are elevated to iconic status and we are presented with the physical embodiment of the Word made word. How did the cult of St. Cuthbert feature in such attempts to locate and integrate England within the early Christian world view? An assessment of the political situation in Northumbria can help to answer this question. From the time of the 'Anonymous' life of Cuthbert onwards it is possible to detect a trend towards promoting Cuthbert as a figure of reconciliation and a rallying point for the 'reformed' identity of Northumbria and of England, in the formulation of which Bede participated and which culminated ideologically in his Historia Ecclesiastica. The translation of Cuthbert's relics in 698 has been seen as the chronological focus for activity surrounding the cult and the production of associated works. I would suggest, however, that the later period coinciding with Eadfrith's time as bishop of Lindisfarne (698-721) was equally defining and merits consideration in this respect. Following Wilfrid's death, around 710, a purple codex penned in gold and silver and enshrined in a jewelled case, was apparently the focus of attempts to establish a cult of St. Wilfrid at Ripon. Perhaps it was at this time that the need for a similar adornment of the shrine of St. Cuthbert was commissioned, in the form of the Lindisfarne Gospels. What might it actually have meant to those who dedicated their lives to God's service to be entrusted with the transmission of the Word, as preachers and as scribes? I would propose the extension of the well-known metaphor of the scholar-priest to that of the scribe-priest. Bede pursues this theme in relation to Ezra the Scribe, who fulfilled the Law by restoring / writing its destroyed books. The act of writing is presented as an essential personal act for the scribe / preacher / teacher, as well as a fundamental act of transmission and evangelisation. Such scriptural resonances have a bearing upon the circumstances of production of the Lindisfarne Gospels. This amazingly complex and elegant book is the work of a single artist-scribe. Modern scribes estimate that at least two years of full-time work - with optimum physical conditions of heat and light and no distractions - would be required to produce such a work. A basic time and motion assessment of the time needed to undertake such a task alongside the other monastic duties of the Divine Office, prayer, study and manual labour, would suggest something more like a decade of an individual's time would actually have been required. The act of copying and transmitting the Gospels was to glimpse the Divine and to place oneself in its apostolic service and this may, on occasion, have been seen as a solitary undertaking on behalf of the community, rather than a communal collaboration, as with many aspects of Celtic eremitic monasticism. As such these books are portals of prayer, during the acts of both making and using. Bedan exegesis of the early eighth century and the Ezra miniature of the Codex Amiatinus (known to have been completed by the time of Ceolfrith's departure for Rome in 716) are discussed in relation to the Lindisfarne Gospels' Matthew miniature. This is interpreted as a multivalent image: depicting the author of the Gospel; exploring the symbolic witness of this Gospel; and emphasising, at the opening of a Gospelbook, the harmony of the Old and New Testaments. It is suggested that this miniature fulfils for the Lindisfarne Gospels something of the function of the quire of figurae which introduces the Codex Amiatinus. It reacts to the complex theological and iconographic preoccupations contained therein and adapts them to the needs of a Gospelbook. This is no mere copy of or garbled reaction to a Cassiodoran or Wearmouth / Jarrow exemplar, but an active response to shared agendas. Such a context would again suggest a somewhat later date that the traditional '698' for production of the Lindisfarne Gospels. Technical features of manufacture, iconographical, palaeographical and textual arguments are adduced in favour of a reaffirmation of a link with the Durham and Echternach Gospels, but it is proposed that Lindisfarne is the latest of the three to have been made and that the most appropriate date for its production lies within the second decade of the eighth century. The nature of a connection with the Wearmouth / Jarrow scriptorium is discussed, as is the contextual evidence for production at Lindisfarne itself (as well as that of the later colophon), including material remains: the Coffin of St. Cuthbert, his pectoral cross and a number of inscribed name-stones. In this context the design process underlying the ornament and display scripts of the Lindisfarne Gospels is discussed and the discovery announced of numerous preliminary drawings (in addition to those formerly noted on the back of the carpet-pages), revealing the innovative way in which the artist worked (Figure 1 shows one such preliminary drawing). 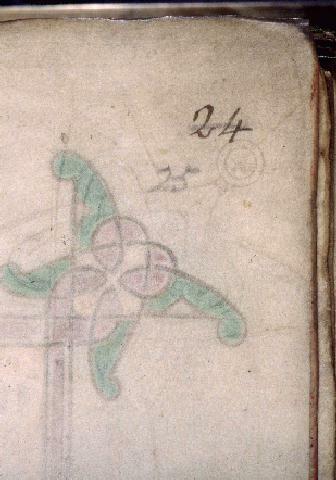 This is the first western manuscript to feature lead-point drawings. The use of this medium seems to have occurred to the artist-scribe whilst ruling the text with a hard-point containing lead or silver trace elements. Almost every decorative element is drawn first on the other side of the leaf. This implies that the designs were worked out on the reverse and traced through with the aid of prickings and back-lighting. The rear of the leaf served as a motif-piece for the painted designs. Once the detailing was established in principle it was replicated elsewhere in the design without the detailed back-drawing and the penwork executed freehand with remarkable confidence and skill. The designs also show important signs of being devised in situ, rather than copied directly from exemplars, for they sometimes diverge from what was actually painted. This is creative work-in-progress of an advanced order. It is unfinished in places and gives the impression of being interrupted in the final stages. It is unlikely that its maker would not have completed it if humanly possible (despite claims of an overt statement of human fallibility, which might account for some, but not all of the ommissions). A possibility is that illness or death intervened. If Eadfrith were indeed the maker of the book, as the later colophon states, his death in 721 would accord with the dating suggested here. The Lindisfarne tradition of combining text (with distinctive scripts) and image, seen on Cuthbert's coffin and portable altar, on the name-stones and in the Lindisfarne Gospels' evangelist miniatures is also discussed and further newly observed drawings noted. Sections of display script written in the distinctive angular, rune-like capitals are accompanied by layout under-drawings in hard-point - not primarily in the display script but in enlarged half-uncials of the sort used for the main text. The display script was not being copied from an exemplar but was being intentionally composed. The style of lettering was important. It needed to 'ring bells' in the audience's mind of both 'romanitas' and 'englishness'. Such cultural integration may also have motivated the designers of Cuthbert's coffin to have parallel Latin and runic inscriptions carved for display to those visiting the shrine. For the overwhelming visual impression that the Lindisfarne Gospels still convey is not only one of sublime artistry but of combined ethnicity. I would suggest that here, as in the development of the cult of St. Cuthbert and in Bede's History of the English Church and People, a prime motivation was to define (if only intellectually) what it meant to be Northumbrian, to be English, and to be part of the Christian ecumen, encompassing the Italian, Byzantine, Coptic, Frankish, English, British, Pictish and Irish components of the universal Church to produce a new identity expressed in what I would term the aesthetics of reconciliation. To summarise, I would suggest that the Lindisfarne Gospels represents the fusion of the earlier traditions of the Lindisfarne scriptorium, with its Irish components, as represented by the Durham and Echternach Gospels, with the subsequent importation thence of enhanced Italian stimuli via Wearmouth / Jarrow in the service of a recognisable agenda, in the formulation of which it is likely that Eadfrith and Bede participated. These developments could have been protracted and grouping of the manuscripts around the fixed point of the translation of 698 has been misleading. The context for cultural fusion seems to lie best within the period of formalisation of the cult in the first quarter of the eighth century (and the second decade in particular), with Bede's commission to rewrite the first Life of St. Cuthbert in accordance with the needs of this agenda (at the behest of Bishop Eadfrith, probable maker of the Lindisfarne Gospels), his commentaries and his composition of the Historia Ecclesiastica. The three communities - Lindisfarne, Jarrow and Wearmouth - may thus be seen as working together to establish a new identity for Northumbria, and thereby for England in the post-Whitby, Wilfrid-dominated period. This identity acknowledged the components which had established its Christian culture but was intrinsically orientated towards displaying cultural synthesis and reconciliation within the Rome-orientated Catholic ecumen. The apostolic mission had embraced the far ends of the earth and the material and literary culture of these extremities proclaims that they were no provincial outpost, but a vibrant, integrated part of that universal, eternal communion. The full text of this lecture was published at the end of September 2000 as part of the Jarrow Lecture Series, obtainable from: The Lecture Secretary, 28 Kitchener Terrace, Jarrow, Tyne and Wear, NE32 5PU, UK. Copyright © Michelle P. Brown, 2001. All rights reserved. Photo Copyright © The British Library, 2000-2001. All rights reserved.